Deaconess Classie Mae Brownlee was born into time on June 23, 1930, in Arkadelphia, AR to the late Beirney and Celia Nowlin. On Saturday, July 15, 2017, our Heavenly Father gave Baby her heavenly wings. Her infectious smile will be missed. Classie, affectionally known as Baby, accepted Christ as her Lord and Savior at an early age uniting with the Greater Pleasant Hill Baptist Church (GPHMBC). 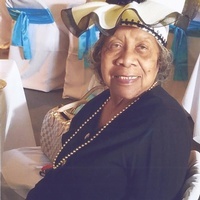 At GPHBC, Baby served as a Deaconess, president of the Usher Board, president of WMU, member of the choir, Hospitality committee (known for her famous peach cobblers), Sunday School Teacher, and finance committee. She was a faithful and dedicated member of the GPHMBC, Pastor Lewis Shepherd, until moving to Manassas, Virginia to live with her daughter (Debra) and son-in-law (James). While living in VA, she worshiped with the Freedom of Praise Worship Center under the leadership of Pastor and Evangelist Anthony Perkins. She became the Mother of the Church and would occasionally sing with one of the choirs. Baby loved the Lord and demonstrated that love throughout her life. Her favorite saying was, "I'm here by the help of the Lord." Upon graduating from high school, she attended Arkansas Baptist College. She held employment with Vassarette Manufactory, Piggly Wiggly and retired as a personal assistant. Some of her life pleasures were reading her Bible (she loved the Word), fishing, going to the beach, riding/traveling, cooking, "sweets", word-search puzzles and being around others talking about the Lord. Her joy was attending church services. She never met a stranger! She got much joy interacting with her favorite son-in-law, James, as she would call him and great grandson Mason. She had a special bond with her granddaughter, Heather, who would often take her for a manicure/pedicure and hair appointments. In her 87th season of life, she surrendered her soul unto the Lord with family and friends at her bedside. She was preceded in death by her parents, son, Oliver Scott, husbands Tracy Scott, Elton Smith and Robert Brownlee; sisters Dorothy Ross, Robbie Gaston, and Odessa Brown; brothers Eddie Cook, Pete Nowlin. Those left to cherish this beautiful lady's memories are: one Sister, Betty (Hayward) Elliott of Virginia; one Brother, Oliver (Lillian) Nowlin of Maryland; three Daughters, Debra (James) Fuller of Virginia, Shelia Scott and Sarah Robinson both of Arkansas; four Sons, Tracy (Elvalyne) Scott, Marshall Robinson, Harold (Tongela) Robinson and Elton (Gwendolyn) Grant all of Arkansas; 17 Grandchildren, Heather Fuller, Tameka (James) Ekpa, Jessica Scott, Jahleel Scott, Bernard Scott, Kevin Middleton, Olivia Scott, Shingo Brownlee, Dorsette Owens, Jafari Robinson, Felicia Graham, MaKenley and Terrence Robinson, Elton Jr., Crystal, Marci and Jasmine Grant; two special daughters Rebecca (Mark) and Jennifer (Sam); 15 great grandchildren, Mason, Ajala, Jagen, Kai Elton, Harmony Classie, Jakobi, Jakyri, Khalil, DeShawn, Areis, Michael, Cameron, Jordan, Ja'Kayla, Keyasha and special lifelong friends Ethel Stephens, Ruthie Knox, Maria Hill-Holms and Vivian Harris. Baby, you fought the good fight now take your rest! Family and Friends will gather at Greater Pleasant Hill Baptist church to share memories and milestones and watch the Life tribute DVD of Classie Brownlee from 6:00 p.m.-7:00 p.m.
Burial will be in Helms Cemetery Arkadelphia, AR.